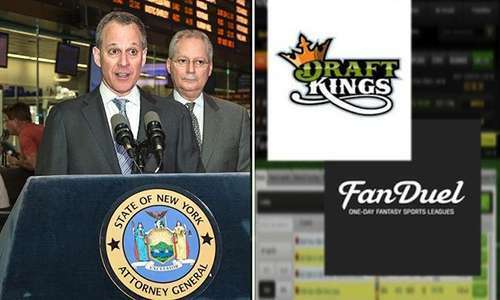 The stakes continue to increase in the legal showdown between the New York Attorney General’s office of Eric T. Schneiderman and major daily fantasy sports sites DraftKings and FanDuel. Already beset by a raft of illegal-gambling and marketing-fraud charges brought by NY AG Schneiderman back in November, the two DFS online giants are now facing an amended complaint filed by Schneiderman’s staff on New Year’s Eve. The “Happy New Year!” present from Schneiderman to the two DFS giants — who together, control more than 90% of the online DFS market — appears designed, as many observers have noted, to not only drive the DFS providers from New York State, but to drive them out of business as well. The amended New York complaint seeks full restitution of all funds wagered by New Yorkers on the site, as well as punitive damages, payable to the state of New York, of up to $5,000 per player. Several news reports cite New York as comprising roughly 10% of all DFS play. A recent ESPN update states that in 2015 alone, DraftKings and FanDuel are estimated to have collected a combined $200 million in entry fees from New York’s 600,000 or so DFS players. And as such, both DraftKings and FanDuel are mounting a fierce legal defense, as if their very corporate lives depend on it… which they do. The two companies succeeded in obtaining a stay of Schneiderman’s initial injunction, and have already begun a similar process regarding the amended complaint. DraftKings filed its initial response to the amended complaint yesterday, including a motion to stay the matter pending the trial schedule the two sides had previously agreed to. 1. The Attorney General has still offered no evidence that supports a preliminary injunction. 2. Daily fantasy sports contests are not gambling — their outcome is controlled by the knowledge and skill of DFS players — that’s how you win or lose. 3. The only difference between a daily and a season-long fantasy contest is how long it lasts and the Attorney General has said that season-long fantasy sports contests are lawful.